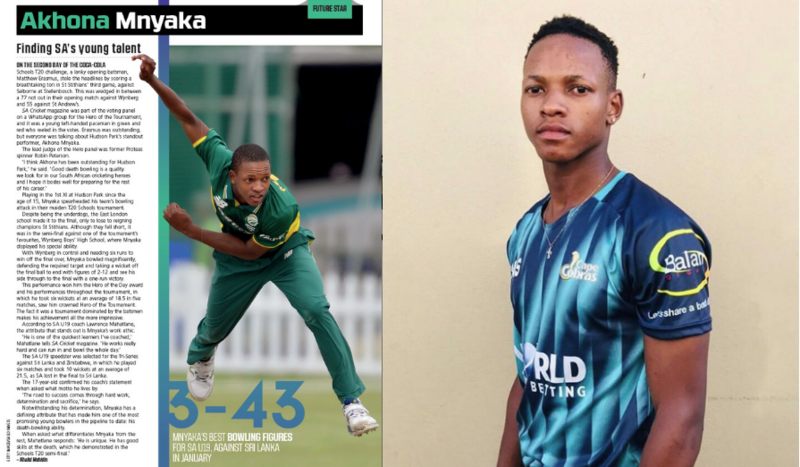 Akhona Mnyaka, who recently signed with the Cobras, was our Future Star in issue 137 of SA Cricket magazine in July 2017. 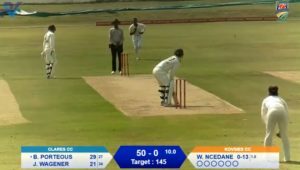 On the second day of the Coca-Cola Schools T20 challenge 2017, a lanky opening batsman, Matthew Erasmus, stole the headlines by scoring a breathtaking ton in St Stithians’ third game against Selbourne at Stellenbosch. This was wedged in between a 77 not out in their opening match against Wynberg and 55 against St Andrew’s. SA Cricket Magazine was part of the voting panel for the Hero of the Tournament and on the Whatsapp group that determined the winner, but it was a young left-handed paceman in green and red who reeled in the votes. Erasmus was outstanding, but everyone was talking about Hudson Park’s stand-out performer, Akhona Mnyaka. The lead judge of the Hero panel was former Proteas spinner Robin Peterson. Playing in the first team at Hudson Park since the age of 15, Mnyaka spearheaded his side’s bowling attack in his school’s maiden T20 Schools tournament. Despite being the underdogs in the tournament, the East London-based school made it to the final, only to lose to reigning champions St Stithians. Although they fell short, it was in the semi-final against one of the tournament’s favourites, Wynberg Boys’ High School, where Mnyaka displayed his special ability. With Wynberg in control and needing six runs to win off the final over, Mnyaka bowled magnificently, defending the required target and taking a wicket on the final ball to end with figures of 2-12 and see his side through to the final with a one-run victory. This performance won him the Hero of the Day award, and his performances throughout the tournament, which saw him take six wickets at an average of 18.5 in five matches, saw him crowned the Hero of the Tournament in a competition dominated by outstanding batting. His desire to work hard and put in more effort than expected from him is what stands out most about the budding young speedster. This may seem a blanket statement, but according to SA U19 coach Lawrence Mahatlane, the attribute that stands out is Mnyaka’s amazing work ethic. The SA U19 speedster was selected for the Tri-Series against Sri Lanka and Zimbabwe, which saw him play six matches and take 10 wickets at an average of 21.5, as SA lost in the final to Sri Lanka. The 17-year-old confirmed his coach’s statement when asked what motto he lives by. ‘The road to success comes through hard work, determination and sacrifice,’ he says. Notwithstanding his determination, Mnyaka has an unknown quality that has made him one of the most promising young bowlers in the pipeline to date: his death-bowling ability. Move two years on and the Cobras announced on 20 January that they have signed the now 19-year-old, to the delight of their CEO and coach.